After a groundbreaking redesign aimed at increasing comfort, the 2019 Jeep Wrangler is now far more than just the world’s most qualified trailblazer. The 2019 Jeep Wrangler steps up its safety game with a few new modern features. Specifically, forward collision warning technology is now available to alert drivers to near and present danger. The 2019 Wrangler also introduces adaptive cruise control. When it’s engaged, this system monitors the vehicle ahead, speeding up and slowing down according to traffic flow. For drivers who spend more time on a city road than a trail, this feature can be invaluable. Which 2019 Jeep Wrangler is best for me? Good question! 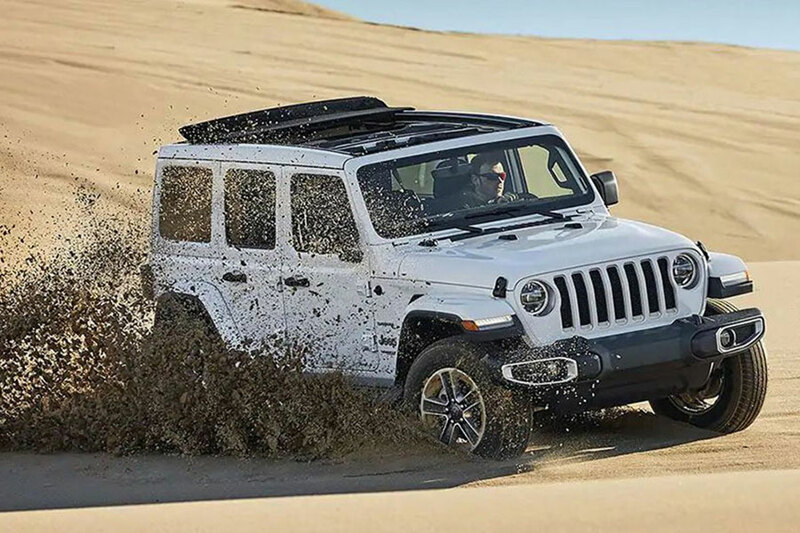 Every 2019 Jeep Wrangler is ready for off-road travel, thanks to features like standard four-wheel drive. But not every Wrangler is as comfy as the next. Before you choose one, consider both how deep you plan to travel into off-road territory and whether or not you can live without power windows and locks. There are two Wrangler body styles out there: the classic two-door SUV and the four-door Wrangler Unlimited. Besides an extra set of doors, the Unlimited is also longer, which means extra leg room inside the cabin. 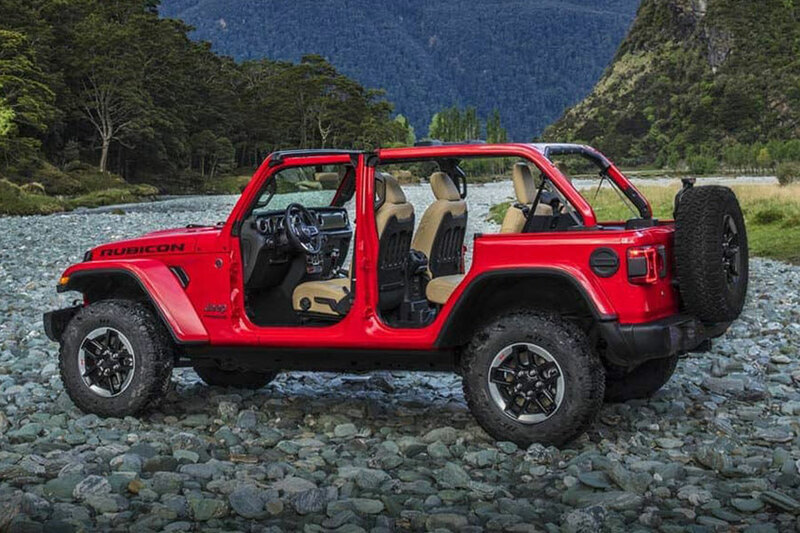 The two-door Wrangler is available as three trims: the Sport, Sport S, and Rubicon. The Wrangler Unlimited offers two more trims – the Sahara and the Moab. These two Unlimited trims slot between the Sport S and Rubicon in the Wrangler hierarchy. The 2019 Jeep Wrangler Sport is better than ever. Whereas it was once a barebones utility vehicle, this trim now includes niceties like air conditioning (standard on the Unlimited, optional on the two-door model). If you’re looking for a basic, no-frills foray into the wilderness, the Sport just might do the trick. And, as the entry-level model, it’ll also save you money that you can put towards your next adventure. The Sport S is for drivers who can’t live without most modern conveniences – think power windows and locks, remote locking and unlocking features – but still don’t want to pay extra for frills. Smartphone addicts will appreciate all that the Sahara Unlimited has to offer. Since the 7-inch touchscreen is loaded with Apple CarPlay and Android Auto, you can coast through the wilderness with hands-free access to your phone. The Sahara also appeals to those who crave an increasingly rugged stance. Its 18-inch alloy wheels and painted exterior body panels and trim set it apart from lesser Wranglers. The Moab Unlimited adds to the Sahara’s style with unique black wheels, black exterior trim, and a steel front bumper. But it’s also more capable. If you count boulder hopping among your hobbies, the Moab’s rock rails and limited-slip differential will help you on your quests. Under this Wrangler’s body-colored hardtop, you’ll find the luxury works- premium leather upholstery, a nine-speaker Alpine audio system, whatever you need to make the transition from roughing it to truly enjoying the ride. 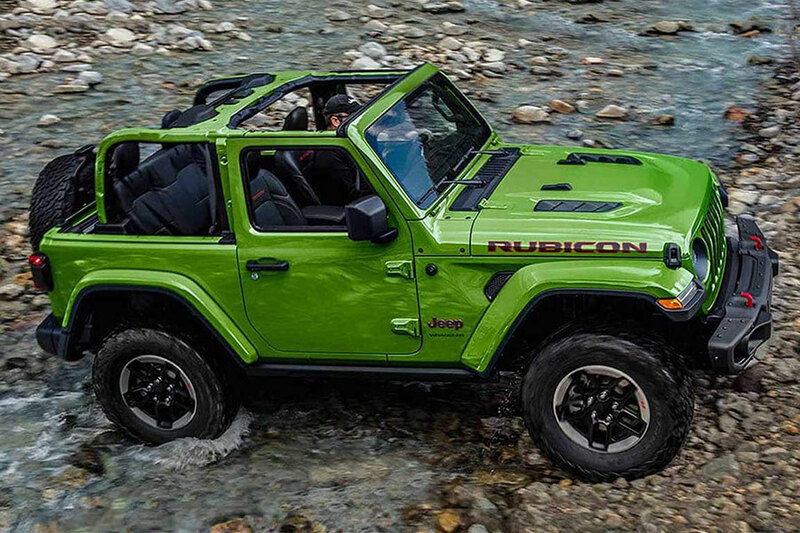 For true trailblazers, there’s no better pick than the Wrangler Rubicon. This Jeep was specially designed to power through the elements. That’s why it includes special off-road tries, a shorter 4.10 axle ratio, and four-wheel drive with low-range gearing. That’s not all, though. The electronic front and rear lockable differentials give you the upper hand in especially difficult terrain. And the electronically disconnecting front roll bar and rock rails come in handy when the going gets rocky. Can the 2019 Jeep Wrangler tow? Yes, the Wrangler can tow–even a boat. However, it depends on how big of a boat we’re talking. Towing capacity also depends on the Wrangler’s body style and equipment. Properly equipped, the 2019 Wrangler Unlimited can tow max loads of up to 3,500 pounds. Two-door Wranglers can tow max loads of 2,000 pounds. Will the Jeep Wrangler get a diesel engine? Although Jeep has yet to confirm engine specs, a 3.0-liter diesel engine is expected to be available late in the model year. 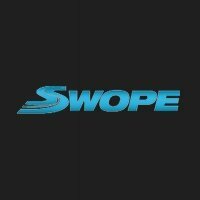 If you feel you really can’t live without this rugged, tow-friendly engine, hold on for a few more months.